Codman was a fine sculptor who was well known for his small bronze works. Most of these were of animals, especially dogs. 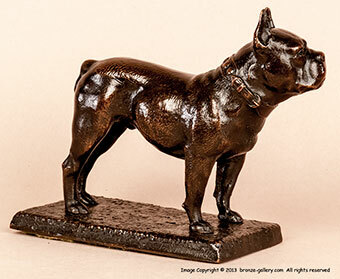 He sculpted an Airedale Terrier, a Collie, a Bulldog, a French Bulldog, a Scottish Terrier, and other breeds. 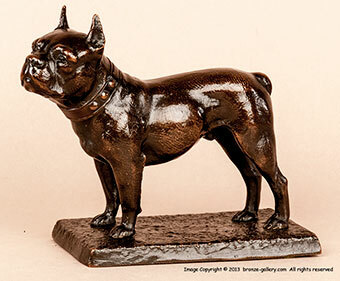 This bronze is a fine portrait of an all American dog breed, the Boston Terrier. These dogs were very popular around the turn of the century. They were developed from the old bull and terrier fighting dogs, and breed for a smaller size and shorter head. Boston Terriers were fashionable pets with their tuxedo like black and white markings and they remain popular companions today. The Boston Terrier is shown wearing a studded collar and he is standing squarely on the base. A handsome model, he is well cast by the Gorham Foundry with their mark on the base and stamped “BY 404” with a Gorham Anchor showing this is an early cast. He has a fine red brown patina.